The Rust ecosystem is still growing. As a result, new libraries with improved functionality are frequently released into the developer community, while older libraries become obsolete. When we initially designed Exonum, we used the Iron web-framework. In this article, we describe how we ported the Exonum framework to actix-web using generic programming. In the Exonum platform, the Iron framework was used without any abstractions. We installed handlers for certain resources and obtained request parameters by parsing URLs using auxiliary methods; the result was returned simply in the form of a string. let skip_empty_blocks: bool = self.optional_param(req, "skip_empty_blocks")? In addition, we used some middleware plugins in the form of CORS headers. We used mount to merge all the handlers into a single API. Iron was a good library, with plenty of plugins. However, it was written in the days when such projects as futures and tokio did not exist. The architecture of Iron involves synchronous requests processing, which can be easily affected by a large number of simultaneously open connections. To be scalable, Iron needed to become asynchronous, which would involve rethinking and rewriting the whole framework. As a result, we’ve seen a gradual departure from using Iron by software engineers. Actix-web is a popular framework that ranks high on TechEmpower benchmarks. 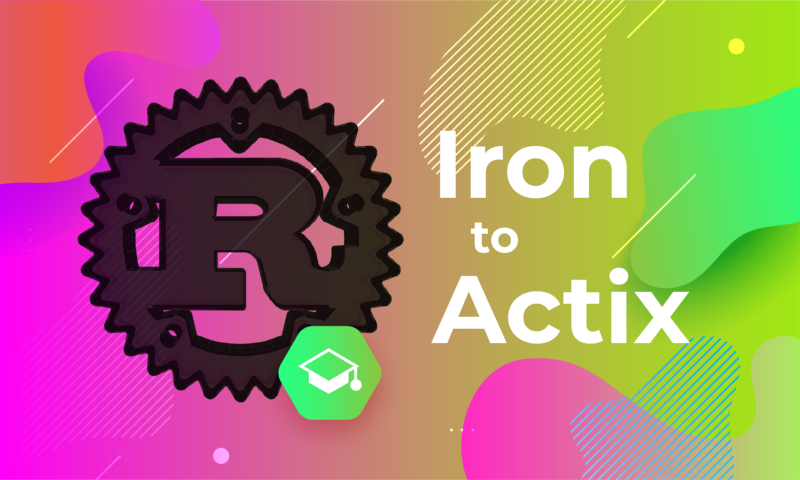 It has an active developer community, unlike Iron, and it has a well-designed API and high-quality implementation based on the actix actor framework. Requests are processed asynchronously by the thread pool; if request processing panics, the actor is automatically restarted. Previously, concerns were raised that actix-web contained a lot of unsafe code. However, the amount of unsafe code was significantly reduced when the framework was rewritten in a safe programming language?—?Rust. Bitfury’s engineers have reviewed this code themselves and feel confident in its long-term stability. For the Exonum framework, shifting to actix solved the issue of operation stability. The Iron framework could fail if there were a large number of connections. We have also found that the actix-web API is simpler, more productive and more unified. We are confident that users and developers will have an easier time using the Exonum programming interface, which can now operate faster thanks to the actix-web design. During this process we realized it was important for us not to simply shift frameworks, but to also devise a new API architecture independent of any specific web framework. Such architecture would allow for creating handlers, with little to no concern about web specifics, and transferring them to any backend. This conception can be implemented by writing a frontend that would apply basic types and traits. Requests are made exclusively by clients; the server only responds to them (the server does not initiate requests). Requests either read data or change data. As a result of the request processing, the server returns a response, which contains the required data, in case of success; or information about the error, in case of failure. Everything else can be considered an extension of this basic entity. Thus, in order to be independent from a specific implementation of a web framework, we need to write handlers in a style similar to the example above. // configured using associated types. // receives parameters from an arbitrary context, through which the request parameters are passed. // For convenience, let’s put everything we need from the handler into a single structure. /// The name of the resource. /// The raw handler. Note that it will be used from multiple threads. This deserialization functionality agrees well with the associated type Request from the `Endpoint` trait. Next, lets devise an adapter which wraps a specific implementation of `Endpoint` into a RequestHandler for actix-web. Pay attention to the fact that while doing so, the information on Request and Response types disappears. This technique is called type erasure?—?it transforms static dispatching into a dynamic one. At this stage, it would be enough just to add handlers for POST requests, as we have created a trait that is independent from the implementation details. However, we found that this solution was not quite advanced enough. // A structure with the context of the handler. // Implementation of the `Endpoint` trait. // Installation of the handler in the backend. Ideally, we need to be able to pass a simple closure as a handler, thus significantly reducing the amount of syntactic noise. Below we will discuss how this can be done. We need to add the ability to automatically generate an adapter that implements the `Endpoint` trait with the correct associated types. The input will consist only of a closure with an HTTP request handler. Arguments and the result of the closure can have different types, so we have to work with methods overloading here. Rust does not support overloading directly but allows it to be emulated using the `Into` and `From` traits. In addition, the returned type of the closure value does not have to match the returned value of the `Endpoint` implementation. To manipulate this type, it must be extracted from the type of the received closure. In Rust, each closure has its own unique type, which cannot be explicitly indicated in the program. For manipulations with closures, we use the `Fn` trait. The trait contains the signature of the function with the types of the arguments and of the returned value, however, retrieving these elements separately is not easily done. /// Simplified example of extracting types from an F closure: Fn(A) -> B. We have to use PhantomData, since Rust requires that all the generic parameters are indicated in the definition of the structure. However, the type of closure or function F itself is not a generic one (although it implements a generic `Fn` trait). The type parameters A and B are not used in it directly. // Verification of the ordinary structure. // Verification of the closure. Now we have a function with explicitly parameterized argument types, which can be used instead of the `Endpoint` trait. For example, we can easily implement the conversion from SimpleExtractor into RequestHandler. Still, this is not a complete solution. We need to somehow distinguish between the handlers for GET and POST requests at the type level (and between synchronous and asynchronous handlers). In this task, marker types come to our aid. Firstly, let’s rewrite SimpleExtractor so that it can distinguish between synchronous and asynchronous results. At the same time, we will implement the `From` trait for each of the cases. Note that traits can be implemented for specific variants of generic structures. /// Generic handler for HTTP-requests. /// A specific handler function. /// Structure type containing the parameters of the request. /// Type of the request result. /// Type of the value returned by the handler. /// Note that this value can differ from the result of the request. // Implementation of an ordinary synchronous returned value. // Implementation of an asynchronous request handler. /// The name of the handler. /// The handler with the extracted types. /// The type of the handler. Next, we declare several empty structures that will act as marker types. Markers will allow us to implement for each handler their own code to convert the handler into the previously described RequestHandler. //requests correspond to this handler, but for the current case POST will suffice. Now we can define four different implementations of the `From` trait for all combinations of template parameters R and K (the returned value of the handler and the type of the request). // Implementation of a synchronous handler of GET requests. // Implementation of a synchronous handler of POST requests. // Implementation of an asynchronous handler of GET requests. // Implementation of an asynchronous handler of POST requests. The final step is to devise a facade that would accept closures and add them into the corresponding backend. In the given case, we have a single backend?—?actix-web. However, there is the potential of additional implementation behind the facade. For example: a generator of Swagger specifications. /// This method adds an Immutable handler to all backends. // we have implemented earlier. /// A similar method for Mutable handlers. Note how the types of the request parameters, the type of the request result, and the synchrony/asynchrony of the handler are derived automatically from its signature. Additionally, we need to explicitly specify the name and type of the request. The approach described above, despite being quite effective, has its drawbacks. In particular, endpoint and endpoint_mut methods should consider the implementation peculiarities of specific backends. This restriction prevents us from adding backends on the go, though this functionality is rarely required. As a result, requests that do not have any parameters must still accept the JSON string null, which is deserialized into (). This problem could be solved by specialization in C ++ style, but for now it is available only in the nightly version of the compiler and it is not clear when it will become a stable feature. Similarly, the type of the returned value cannot be specialized. Even if the request does not imply a certain type of the returned value, it will still pass JSON with null. Decoding the URL query in GET requests also imposes some unobvious restrictions on the type of parameters, but this issue relates rather to the peculiarities of the serde-urlencoded implementation. As described above, we have implemented an improved API, which allows for a simple and clear creation of handlers, without the need to worry about web specifics. These handlers can work with any backend or even with several backends simultaneously.